Does architectural design affect social dynamics? 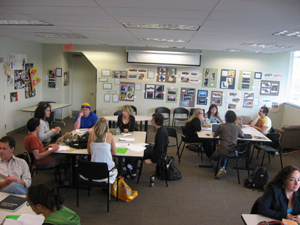 Social Architectures, taught by Derek Lomas in 2007, led 20 students in the production of 10 architectural interventions that were designed to induce observable social change. This seminar was grounded in a literature drawing from art, architecture, cognitive science, sociology, and urban planning. This course was the recipient of a $5000 Open Classroom Challenge Grant from the University of California Institute for Research in the Arts (UCIRA).